Are you looking to send Shalach Manos in Israel (Bet Shemesh, Jerusalem, Beitar ? Look no further than Purimland.com - they have amazing products with such great selections. Monday, August 8, 2016, 6:30 PM, the Rabbinical Alliance of America/Igud Horrabonim (RAA/IGUD) opened with an emergency press conference calling upon the Ministry of Religious Affairs in Israel to support the position of the Chief Rabbinate who oppose any and all innovations that serve to desecrate the sanctity of the Western Wall area. “We, the Israeli emissaries of the Lubavitcher Rebbe, who were personally sent to the Land of Israel by the Rebbe forty years ago in order to “inspire and encourage Jews to fulfill the Torah and mitzvot, and to rebuild the land both physically and spiritually,” include among us both municipal and community Rabbis, heads of yeshivot and kollels, and founders and administrators of educational and charitable institutions. Finally! A curriculum for teaching the Lubavitcher Rebbe's plan for peace in Eretz Yisrael. The Curriculum is material for five classes. Suggested teaching materials are included in the PDF or as links from the curriculum. Starting with a be-iyun study of the halacha 329 in Hilchot Shabbos in both Mishna Brurah and the Alter Rebbe's Shulchan Oruch. Then on to real-time historical reasons backing up the Lubavitcher Rebbe's problem with land for peace that take us back in time to World War II and the Pre-World War II Marienbad Conference organized by Rav Chaim Ozer Grodzinsky and the Klausenberger Rebbe. This fascinating course will have your students sitting on the edge of their seats. Great Camp Material!! 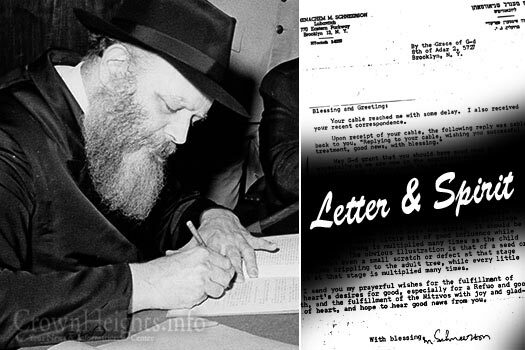 It was the custom of the Lubavitcher Rebbe to write annual general letters on the occasion of various holidays and milestones throughout the year. These letters were addressed to "all Jewish sons and daughters wherever they may be," and delivered an inspiring message pertaining to some aspect of the upcoming holiday. These letters were originally written in Yiddish and were translated into various languages and disseminated throughout the globe. The Hebrew translations to these letters were written by renowned author and educator, Rabbi Tuvia Blau. Because he was based in Israel, and internet and fax were not yet in use, the Rebbe did not review or edit these translations. However, when the Hebrew magazine Kfar Chabad began to publish the letters, the Rebbe would review every issue and edit the letters. Once, after the Rebbe returned the magazine with the edits, Rabbi Blau and the editor of Kfar Chabad, Rabbi Aaron Dov Halperin, noticed something unusual. In the original Yiddish letter, the Rebbe used the term "Yid," ordinarily translated as "Jew," or in Hebrew, Yehudi. But wherever Rabbi Blau had used the term Yehudi in his Hebrew translation, the Rebbe changed it to "adam," person. Rabbi Halperin could not contain his curiosity and called the Rebbe's secretary, Rabbi Leibel Groner, to clarify the matter. “We are all here- United and larger in number than the representatives in the UN who voted for the two state solution to divide Israel." Said Rav Gerlitzky Saturday night November 8 in Crown Heights Brooklyn, to the yearly meeting of Lubavitcher Rabbis from around the world. Referring to recent UN resolutions, Rav Gerlitzky said: "While they represent different countries we represent the Lubavitcher Rebbe, the one and only leader of our generation who vehemently opposed such a scheme. Therefore we hereby declare in the name of all the Shluchim that the UN Resolution is null and void and there never, ever, will be a Palestinian state alongside Israel and every inch of Eretz Yisroel will remain under control of its rightful owner – Am Yisroel,” So declared Rabbi Yoseph Gerlitzky, himself a Lubavitcher outreach director in Tel Aviv Israel. Or as Lubavitcher Chassidim like to title their outreach rabbis: A Shaliach. Rabbi Gerlitzky's brave words, brought a standing ovation and a resounding round of applause by the 4, 325 Chabad Rabbonim attending from around the globe. His words came as surprise. Such statements about Israel's controversial peace process are not usually heard at these meetings. Unusual in itself, for their leader, the Lubavitcher Rebbe commonly made many such statements before 1993 and was known for his vociferous stand against peace. Not that he was opposed to peace, but simply because he felt the agreements were not being done in good faith. In fact he felt and with good reason, that the agreements were being made as a weapon with which to legally destroy Israel. Citing the well known relationship that the Mufti, the father of the Palestinian & Arab Nationalist movements had with Hitler during the war as enough reason to not trust the agreements. (The Mufti of Jerusalem, lived with Hitler in Germany throughout the war) Historically as well, the Arabs have a history of using the issue of peace to promote war. For example, in 1974, while the Arabs prepared for war, Israel was lulled into thinking they weren't serious when the Egyptians asked to start peace talks in Washington. As the peace talkers were talking, Egypt attacked and Israel suffered terrible losses until by great miracles they fought back the Egyptian and Syrian armies retaking Sinai and the Suez Canal. Rabbi Gerlitzky, who is also Chairman of the Rabbinical Congress for Peace, was addressing the annual Chabad Lubavitch International Shluchim Conference in Brooklyn, N.Y. A yearly very prestigious event, perhaps the largest rabbinical convention in the world. During his speech, Rabbi Gerlitzky, accused the UN and all those who support the false hope of a two state solution for the violence in Israel which affects both sides. Using a flip reasoning, he mentioned that every time a Palestinian teenager runs with a knife to stab an Israeli and gets shot, the death of this Palestinian is a result of the false hope of a two state solution. He quoted a ruling in Jewish Law in the laws of Shabbos (Sabbath) (Orach Chaim Chapter 329) about a Jewish border city in a non-Jewish country that is attacked on the Sabbath. The law is that one picks up arms and violates the Sabbath to protect the non-Jewish residents that live in the interior of that country. For if that town falls, the law states, the whole country will more easily be conquered. Here, the legal ruling is discussing the case of a non-Jewish country and a Jewish city. More recent rulings point out that if thats the case for a Jewish town in a non-Jewish country to protect its non-Jewish residents, how much more so for a Jewish town in the Land of Israel to protect Jews! This rule, that safeguarding the safety of the residents of the State of Israel is the priority, over questionable peace agreements, is the bulwark foundation of the Lubavitcher Rebbe's famous campaign against the peace process, calling it: "Making peace with Hitler and his professors." The Lubavitcher Rebbe was never one to mince words when it came to issues of life and death. Rabbi Gerlitzky pointed out quoting this stance, that Jewish law forbids handing over land under Israeli control to foreigners for the smallest bit given of its 30 mile width, only serves as a springboard for overrunning the whole country. Hence, they feel that more terror and stabbings will pressure and precipitate Israel to give more and more. In the words of military officials: “Every Israeli declaration that under certain conditions we will be prepared to concede – this in itself is a prelude to terror." It has nothing to do with the Temple Mount. It has nothing to do with their economic situation (2/3's of the PA Arabs have to work in Israel, for there is no work for them there(UNWRA Report findings)) It has nothing to with what you hear in the media in Israel or outside Israel. It is has to do with one thing only and that is – the Israeli leadership is weak and gives in to the Arab demands. They do not believe in their cause. They aren't believers themselves that Jews are the rightful owners of all of Eretz Yisroel. Therefore the Arab negotiators exploit their weakness and use it as an opportunity to pressure more and squeeze out concessions. Concern For Life and Death Is Not "Political"
Maybe The Torah Is Right? I am reluctant, on principle, to involve a layman, however knowledgeable, even if he possesses s’michah, in a matter that is the subject of debate between rabbis. However, after you received a detailed letter from a rabbi and request clarification, I have no choice but to address myself to the issues at hand in reply, though necessarily not in depth. I must begin with a general but crucial point, namely, that the arguments against my alleged stand are based on misinformation or on misconception of what my opinion is. I find it difficult to understand how this could happen, since I've repeatedly explained my position. So I will recap it once again. Evyatar Slonim, a 22-year-old man, a teacher of emotionally disabled children using horseback-riding therapy, scion of Chabad, descendant of the famous Feiglin and Slonim families, was arrested this week in Israel, sentenced to jail for six months, on charges of . . . what? This is the very question his parents are asking. We asked his cousin Rabbi Moshe Feiglin of the Aliyah Institute in Crown Heights the same question. The family is concerned that their son is being made a scapegoat. For the charges and evidence don’t seem to exist, yet Evyatar is in prison. The other young men jailed with him range in age from 18 to 24, each with similar stories. As reported by UPI News, Evyatar was arrested “based on alleged involvement in a radical Jewish organization” (Kahane Chai). In an interview with Eyvatar’s mother, Mrs. Gila Slonim, an oleh from Australia: “In March of this year, Evyatar was arrested by the Shabak (Shin Bet, Israel’s General Security Service); he was held in their cells (equivalent to solitary confinement) for 12 days. For the first 8 days he was denied the right to see a lawyer, and a gag order was placed on his case for a month, so you never got to hear about that travesty of justice. At the end of 12 days, the court could no longer allow the Shabak to keep Evy, as there were no grounds for this. He was given an Administrative Distancing Order forbidding him from being in Yehuda and Shomron for a year and Jerusalem for six months. “We toyed with making a public outcry once the gag order was lifted. We felt that by airing this in public we would in some way be betraying our country. Because as soon as we began to shout, the whole world was going to find out, and as loyal citizens who love Eretz Yisrael we were very uncomfortable with this. “Today, the government has crossed the red line and placed three young men in prison without the right to a trial. This transgresses basic human rights . . . and our beloved homeland cannot be run in such an undemocratic way. “We feel that Evy and the other two victims are scapegoats who have been targeted at a time when the government is trying to show it is doing something to rein in terror. Just as no charges were pressed, so was no alibi sought. The other boys, one of whom is the late Rabbi Meir Kahane’s grandson, are all suspected of being involved with graffiti on a church (typical Arab activity), and while it’s not stated explicitly, each article on the boys’ arrests carries the story of the burning to death of a young Arab boy (again typical Arab activity)—and, by the way, of a mentally deranged person who stabbed people at a gay-pride parade. While there is admittedly no connection between the three incidents, nor even evidence of the boys’ connection to any of them, the media implication is clear: We are experiencing here an organized “wave” of extremist hate activities by religious Jews. Organized? Wave? Extreme? Seemingly it is more of a “wave” of arrests and imprisonment of Orthodox men and women by police and Shabak without evidence. At least the press is beginning to report the absurdity of Israeli justice, unbecoming for the most democratic state in the Middle East. In Eyvatar’s case, the court was about to drop the charges due to lack of evidence—“the Shin-Bet feared the boys would be released by the court for lack of evidence”—and used the administrative detention law to hold them. “Gedalia spoke of the night of detention: ‘We made aliyah from the United States to a democratic state. Our son was at home last week. They knocked on the door last night, showed a document stating that they were taking him to jail for six months without suspicion and without explanation. Suddenly, we now find ourselves with our son in jail and don’t know anything. We thought there were fair courts here. Mordechai studied Torah, liked everyone, lives outdoors in Samaria (West Bank). The law seems to have a few names. One is the Jewish Terrorist Law. Honenu, the legal aid group defending the boys, has hundreds of similar cases where administrative detention was used against Jews—mostly Orthodox Jews. Yehuda Landsberg was arrested last year. Like the boys arrested more recently, he was accused of non-provable crimes with no evidence linking him to them. Yet he was jailed for two years. The Shabak, faced with no evidence linking him or the other two men jailed with him, set out to create evidence. Moriah Goldberg, an Orthodox young woman, was first arrested at age 13 with two friends for protesting the giving of Gush Katif to the Arab enemy. She was jailed for a month. After her case was publicized by Amnesty International, Israel finally relented and let her and her friends go. In 2012, while doing her national service working in Gush Katif Museum in Jerusalem as a tour guide, Moriah was arrested after midnight, dragged in cuffs out of her parents’ home, interrogated, and jailed until the charges were shown to be baseless and she was released. As reported in HaAretz (June 13, 2014), “A rare scene transpired last week at the Jerusalem Magistrate’s Court: Arieh Perl and another minor from Kedumim were indicted for carrying out a hate crime in Abu Ghosh. The case was exceptional because they were not caught in the act and never confessed to the offense during the investigation, and the indictment was based solely on circumstantial evidence. Commenting on Meir Ettinger’s case, Jerusalem Online reported: “The Nazareth Magistrates Court extended Ettinger’s arrest for another five days. Ettinger, a grandson of Rabbi Meir Kahane, is a prime target for the Shin Bet’s Jewish Department. He is considered one of the leaders of the extreme right in the West Bank. He is accused of unlawful assembly, arson, and conspiracy to commit a crime. But there isn’t evidence connecting Mr. Ettinger to any of the charges. Imagine: With no evidence, anyone, anywhere in Israel may be picked up by government agents, disappear, be tortured (interrogated) for as long as necessary, denied a lawyer, denied being seen by a judge. Denied the right to be judged by evidence. Then be self-incriminated by statements made while being tortured mercilessly. Welcome to Israel. That’s what administrative detention is. Through a loophole in the law, it can be used against anyone in Israel. It’s been used many, many times to unfairly convict hundreds if not thousands of Orthodox Jews for imagined crimes of political dissidence against the state, as “dangers to national security.” The victims are arrested and, in the face of a lack of evidence, they are tortured until a confession is extracted. Many times even if no confession is extracted, they are still convicted. This opens the question of Israeli democracy in general. Are Israelis asked if they would like their homes, businesses, and land given away to Arab terrorists—or are they being told after secret negotiations? More democracy in action. The government’s democracy appears to be a right reserved for the privileged few in power, not a right to be enjoyed by all Israelis. Israel continually demands from the United States the right of self-determination, yet those rights don’t seem to extend to Israelis themselves. For donations for funding the arrested boys’ considerable legal expenses, Eyvatar’s cousin Rabbi Moshe Feiglin of Aliyah Institute in Crown Heights has begun an emergency collection. Donate via PayPal, use the e‑mail comfort@aliyainstitute.com. https://aliyainstitutecom.clhosting.org/templates/articlecco_cdo/aid/633285/jewish/Donate-Online, and enter a note that this is for the Slonim family and the other boys arrested. Or send checks—payable to Aliya Institute, with a memo that it’s for the Arrested Boys Emergency Fund—to Aliya Institute, 525–527 E. New York Ave., Brooklyn NY 11225-4513. The girls toured the trailer homes called in Hebrew: "Caravans", and watched a movie called, “The story of Gush Katif.” Chabad Shaliach for the residents and former shaliach to Gush Katif, Rabbi Yigal Kirzensaft told them about the quality of life for the former residents before, during and after the expulsion. The girls were shocked to see the photos of the expulsion and how many of the expellees are still living in rickety caravans even today, ten years later. Despite the extreme heat, the girls stayed in Nitzan for a long time. They asked many questions and didn’t understand why the Jews were expelled from Gush Katif. The girls gave tzedakah for the needy of Gush Katif and promised to be ambassadors for Shleimus Ha’aretz on their return home. Bomb Shelters for the undesirables? Sewage pipes rolled in by the Israeli government act as dubious protection against Ketyusha rockets. Artful messages on a sewage pipe bomb shelter in Nitzan encapsulate the spirit of families removed from their Gaza Strip homes in 2006. Two words on the right translate to: “We told you.” On the left is a quote from the 23rd Psalm: “I will fear no evil, for You are with me. The middle says: "We were expelled Orange, we have received Red". Perhaps a reference to broken government promises about permanent housing? Many residents are forced until today, ten years later, to keep up bank payments for mortgages and loans on houses, farms and properties taken from them and given to the Arab enemy. Additionally, they are forced to pay rent on the shabby trailer homes. I’m sure one could turn up some example, but you’d have to dig pretty deep to come up with another nation that gave away parts of a tiny country to a well-disposed neighbor. To come up with another nation that handed its land on a platter to implacable foes you’d have far deeper to dig. Foolhardy is hardly the word. Nihilistic might be the right word. Like a child craving attention, Israel looked about for compliments only to have to ward off cudgels. Can a person entertain even the possibility of refusal in the event of a collision with conscience? Is this a legitimate position? Making a case for defense of the Land of Israel, from the point of view of safety and security for all who dwell there, the Lubavitcher Rebbe brings to the foray a brilliant point of view seemingly devoid of religious considerations. In reading these letters, we see the Rebbe begging Israeli diplomats to use every opportunity to gain an advantage for the Jews of the land of Israel simply so they will be safe. They should not have to live in fear. These are letters to Israeli prime ministers, generals, state officials, prominent rabbis and anyone the Rebbe felt could make the smallest difference. The legal removal of Jews from their land by their own government appalled the Rebbe. While the Rebbe is certainly no Zionist, putting Jews in danger is forbidden, no matter who they are. Jewish law sees the safety of every Jew as the responsibility of incumbent on everyone, overriding the most religious considerations, even Shabbos. Download and have your printer prepare it as a booklet printed two-sided on 9 pages (8.5 inches by 11). To have us print them for you email Shevi at: Outreach Materials Coordinator Cost is $6 plus shipping. "The existence of our people depends on remembering"
Historic board meeting presents events of a decade since the uprooting of Gush Katif. Dozens of important Israeli public figures gathered yesterday for a meeting of Gush Katif Museum in Jerusalem. Dozens of prominent public figures from all walks of life gathered yesterday (Sunday) at the Dan Panorama Hotel in Jerusalem to celebrate a board meeting of the Gush Katif Museum in Jerusalem that marks a decade since the uprooting of Gush Katif and the disengagement. KFAR CHABAD, Israel -- From 6,000 miles away in Brooklyn, followers of a partly paralyzed rabbi who has never been to Israel are financing Jewish opposition to the Israeli-Palestinian peace agreement. The Lubavitcher ultra-Orthodox sect is dedicating "big millions" of dollars to the campaign against the agreement providing limited autonomy to Palestinians, according to the head of the group here. They are raising money for the effort partly through full-page advertisements in the New York Times soliciting "tax deductible contributions" to help "thwart this suicidal withdrawal." "We really believe lives are in danger because of this" agreement, said Rabbi Yosef Aronov, director of the Chabad movement in Israel. "We are doing everything we can to oppose it." The Lubavitchers have run dozens of full-page advertisements in Israeli newspapers, have rented a fleet of 1,000 buses for a rally at $200 a bus, have plastered billboards and printed banners with their slogan "The Land of Israel is in Danger," and have underwritten phones, cars and other logistics of the opposition campaign. People looking at us from the outside are scratching their heads and saying: What's the matter with these people? Have their brains leaked out of their heads?